Hi, Donna Schmidt, reporting from Il Fresco in Orangeburg. 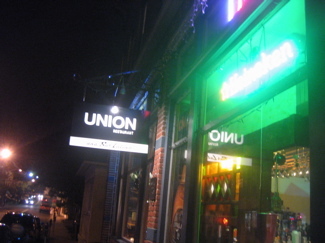 The restaurant was lit up for its guests Tuesday night. A warm, cozy and friendly Sage Room welcomed us with its fireplace and hand painted stucco taupe colored walls. 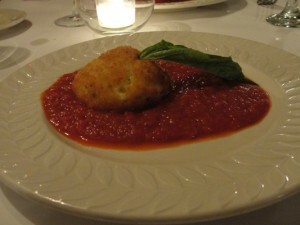 For “Act One” as Il Fresco called it on their Hudson Valley Restaurant Week menu, the Arancini Di Riso a Sicilian golden rice ball coated in panko breadcrumbs, then infused with mozzarella and prosciutto and served on a bed of a tomato sauce called my name. This ball’s sauce could certainly compete with my Neapolitan grandmother’s gravy. The rice ball was a creamy, not at all dry, circle of golden delight with just enough prosciutto to give a hint of flavor and not overwhelm. “Act Two” was Stufato Di Manzo, an Italian stew with melt in your mouth short ribs, carrots, peas, potatoes with a touch of red wine and tomato. 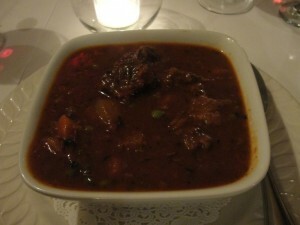 This stew was warm and hearty and called for several pieces of Italian bread for dipping. A nice rich meal for a still cold March evening. 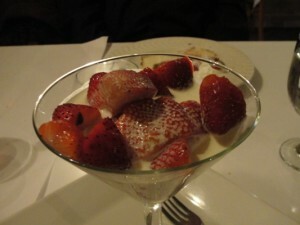 For dessert I chose the Fragole Che Nuotano or fresh strawberries swimming in a light sweet cream. These berries were a very refreshing choice after the warm and rich stew. The 411 on Il Fresco. Nice review and we wish him well. Terrible news about Frank, I hope it is something that can be handled. 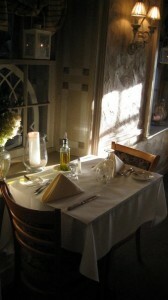 Nice review (and photos are stupendous) by the gustatorily inclined gourmand (without the excess, of course), Donna . 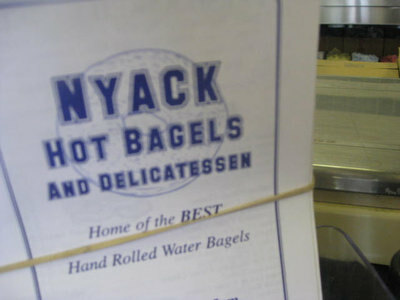 … bon appetit, here, there, anywhere … look forward to other works by DS.